At exactly eight PM last night the inaugural game of the Indian Premier League unfolded in a packed Chinnaswamy stadium in Bangalore. Team Kolkata batted first, with New Zealander Brendan McCullum putting on a clinic, batting for 158 off 73 balls and leading his team to a 222 for 3 score for the twenty over inning. McCullum seemed invincible, with ten fours and an astonishing thirteen sixes. In his last over he has three sixes, including a powerful upper-deck shot on the final ball of the inning. The Bangalore Royal Challengers simply had no chance. Ishant Sharma, playing for Team Kolkata, took a wicket on his first pitch. And it was all downhill from there as Bangalore went all out at 82 runs scored. A few years later I found myself out of my element once again watching a fleet-footed Nathaniel running up and down the lacrosse field. Fortunately, none other than John McPhee wrote a series of short essays on the sport that helped me make sense of the game. I wrote a blog entry, “Spin Right and Shoot Left” that tries to pull together my first glimpses of this new activity. 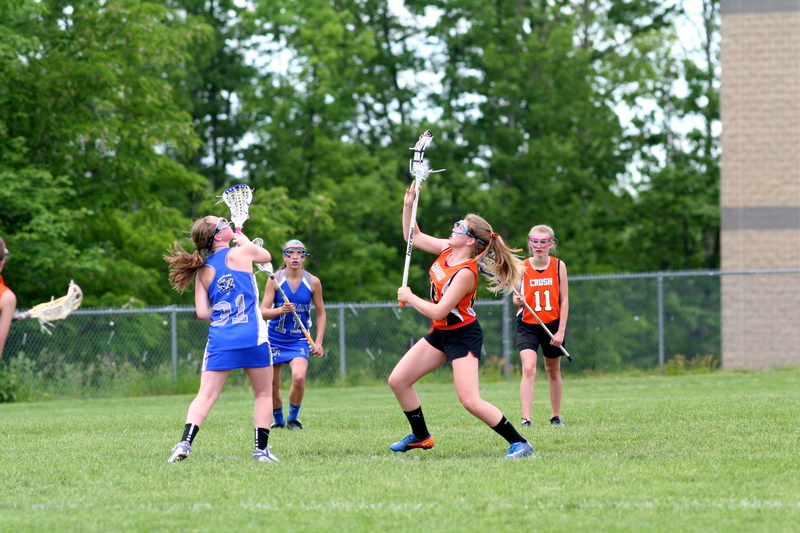 And now, the past two years, Ellinore and girls lacrosse. Ellie shooting the ball. . .
and putting it in the back of the net! 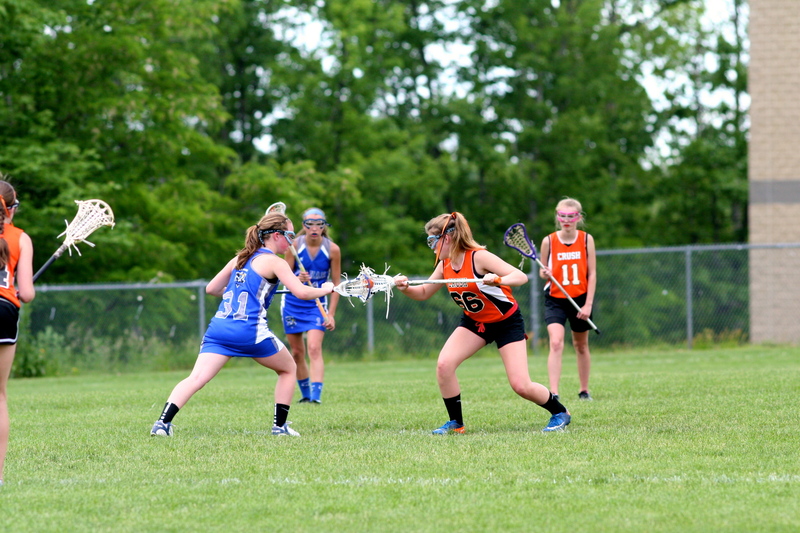 Girls lacrosse is different than boys lacrosse. 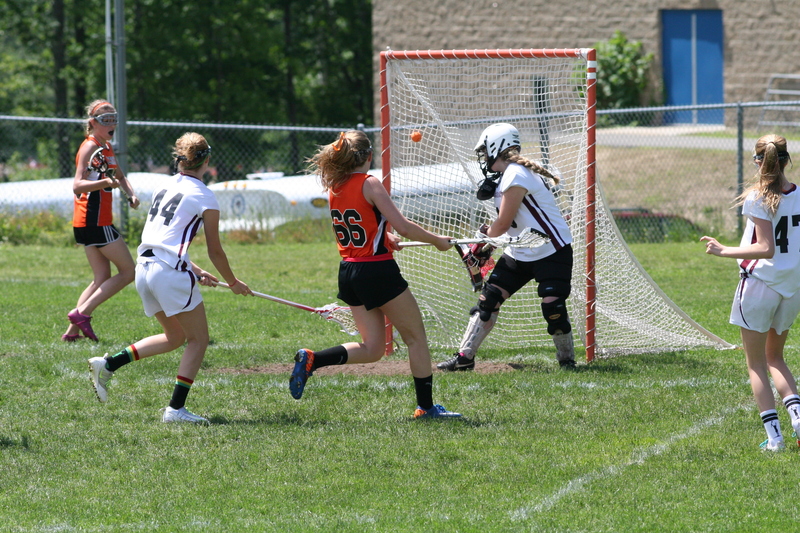 It is much less physical (the girls do not wear helmets or pads) and the stick heads have a much shallower pocket making cradling the ball more difficult. 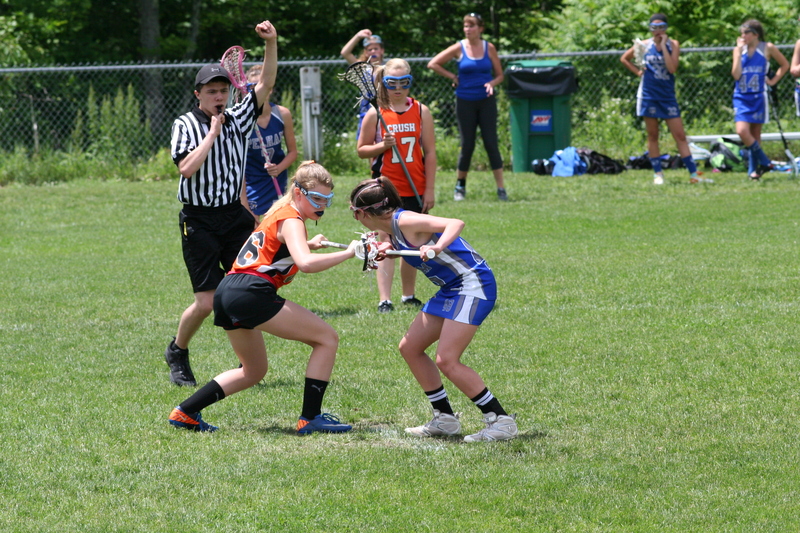 To the untutored eye, the rules of girls lacrosse the game appear to be arbitrary, with whistles blowing for reasons that make little sense when is coming from the boys game. 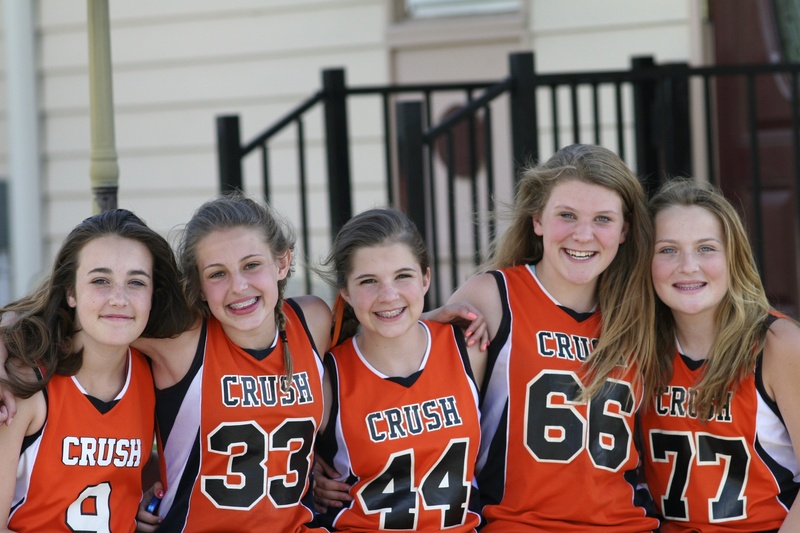 There is very little physical contact in girls lacrosse. The face offs are different, too. 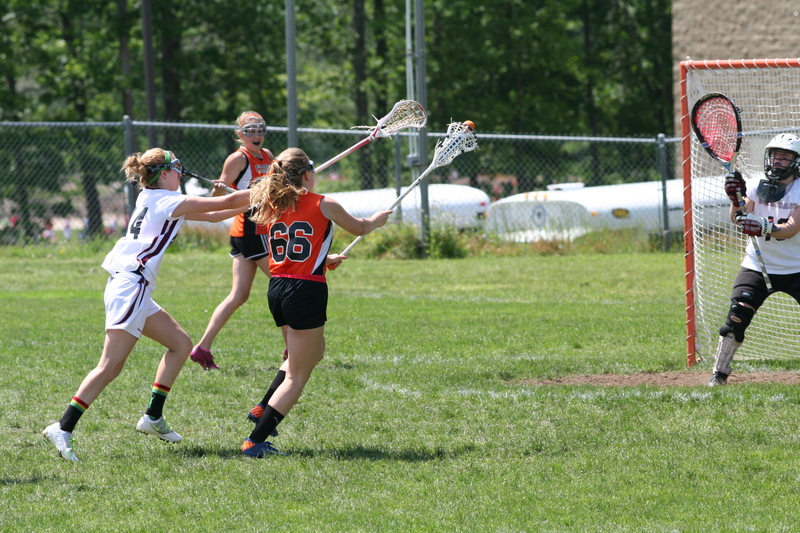 But Ellinore appears to have a knack for the face off and so this is one of her roles on her U-14 team this year. The opponents each stand with one foot toeing the center line. The crosses (shaft and head combined) are held in the air, above hip level with the lower side above the center line and back to back, so that the players’ crosses are between the ball and the goal they are defending. The entire length of both crosses must be contained within the vertical plane of the center line. 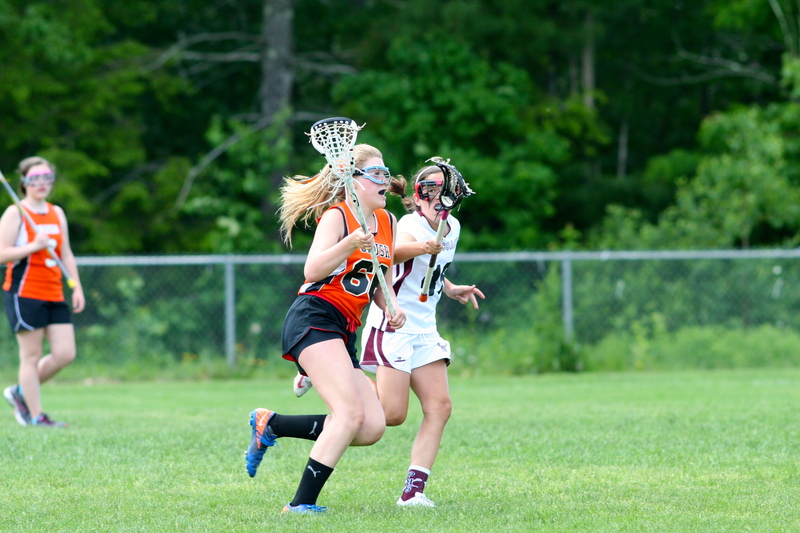 A player’s top hand may not contact any part of the sidewall or pocket. The ball is placed between the crosses by the umpire and must be placed in the upper third of each head at its widest point. When setting up the draw, the umpire should be aware of possible height differentials between the centers and place the crosses in such a way that neither player gains an advantage. On the word “ready” the players taking the draw must remain motionless except for head movement until the whistle. On the whistle the two opponents must immediately draw their crosses up from the starting position. The flight of the ball must attain a height higher than the heads of the players taking the draw. It is actually a pretty neat set up, as the pictures of Ellinore suggest.